These Cloze Notes are specifically designed to accompany my 6 Traits of Writing PowerPoint Presentation, which is NOT included in this file. 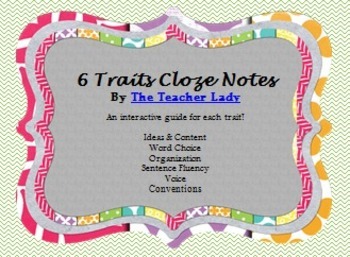 Used in tandem with the PowerPoint Presentation, the Cloze notes teach students about the 6 Traits of Writing by breaking down the meaning of each trait, using helpful acronyms and pictures. For example, writing that displays good Ideas & Content is usually FIDO - Focused, Interesting, Detailed, and Original. 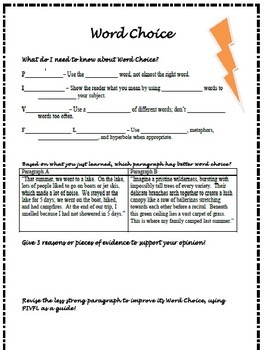 The Cloze notes in this file follow each page of the PowerPoint Presentation and contain moderate fill-in-the-blanks, so that students can take notes in an efficient and effective manner. 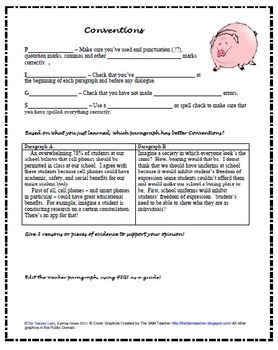 Each page of the notes also gives students practice in revising for the trait of focus.